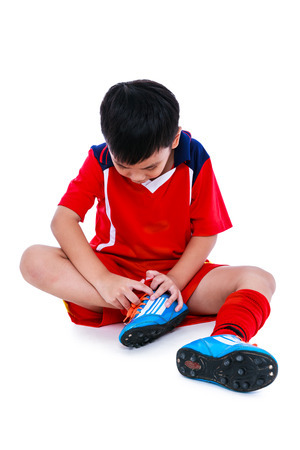 Since children often can’t fully articulate their symptoms, always keep an eye out for unusual behaviors such as tiptoeing, limping, or some other unusual look because a foot or ankle problem may be the cause. Any pain or discomfort that persists for more than a few days should be evaluated by your foot doctor to ensure proper identification and treatment. Flatfoot—Poor arch support can cause kids to have pain in their feet, knees, hips and back. This condition can also occur with no symptoms, so it is important to notice your child’s gait when he or she is playing sports to check for any signs of overpronation. This condition can be treated with custom foot orthotics. Ingrown toenails—A toenail pushing into the skin is quite painful and if it has broken through the skin an infection can occur. Ingrown toenails are often caused by footwear that is too tight, and from improper nail cutting technique. Nails should be cut straight across to help avoid this condition. Plantar warts— These warts are caused by the human papillomavirus and usually form on the bottom of the foot where they can be hidden under thick skin causing severe pain when walking or standing. They can be difficult to treat, so see your podiatrist for assistance. Sever’s disease— Since the growth plate is not fully developed in youngsters, inflammation can occur that may be exacerbated by participation in sporting activities. These may need to be curtailed until the child outgrows the condition. Perform a visual inspection of your child’s feet every few days and if you see anything unusual or if your child is complaining of pain in the feet or ankles, make an appointment with your podiatrist right away. At E.J. Nemet Podiatry in Twinsburg, E.J. Nemet, DPM, treats a variety of foot and ankle conditions, including sports injuries, pediatric foot problems, diabetic foot complications, nerve disorders, and toenail and skin conditions. With advanced technologies and a dedicated staff, Dr. Nemet provides expert and compassionate care to patients in the Twinsburg and Beachwood areas. To contact us or to schedule an appointment, please call (234) 212-9940.